Climate litigation in Canada is hitting more roadblocks after Mike Layton, a member of the Toronto city council, introduced a motion that asks the city to track costs related to climate change and study legal strategies to “recover costs” from energy companies. Like other attempts to get Canadian municipalities onto the climate litigation bandwagon, this motion was swiftly met with intense scorn by those who view litigation as an ineffective and divisive tactic to deal with climate change. 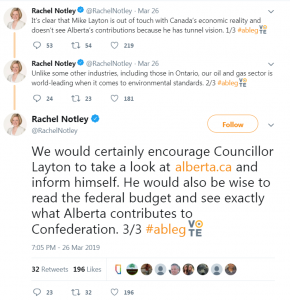 The news attracted especially intense opposition from Alberta, the home base for Canada’s oil and gas sector, whose economy is currently suffering due to a lack of pipeline infrastructure. Albertans are currently gearing up to head to the polls and vote for a new leader to run their province and both candidates quickly derided the motion. Notably when the resort community of Whistler sent a letter to Canadian company CNRL demanding money for climate damages, oil and gas companies pulled out of an investor conference scheduled to occur last February. More recently, the Victoria Chamber of Commerce and the Hotel Association of Greater Victoria both sent letters to Victoria’s Mayor Lisa Helps asking her to abandon her push for a lawsuit, echoing others’ concerns. Before the first lawsuit has even been filed in Canada, proponents of climate litigation have encountered intense criticism for further polarizing an issue that is already contentious. Perhaps they should heed the advice of their critics and seek consensus driven solutions to this global issue instead of playing the blame game.